Cardinal Vincent held a special Mass for all of the Jubilarians within the Diocese, at the Chapel in Archbishop House on 14th June, in thanksgiving for the milestone completed in service of the Lord and the community at large. 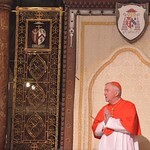 Seven Jubilarians, along with all four of the Auxiliary Bishops were present for the Mass. Post Mass, the clergy headed for a celebratory lunch that was prepared for the eventful occasion.